FILE - Sandhill cranes begin a playful hopping and leaping as the sun rises on the Platte River in central Nebraska, a staging location of one of the world's largest migrations. 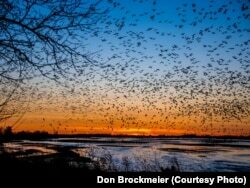 One of the world’s greatest migrations pauses every March in one humble place, central Nebraska’s flat landscape full of cornfields, located in the middle of the United States. Last year, a record 1 million of the lanky, playful birds — about 85 percent of the world’s population — stopped on their northward migration. 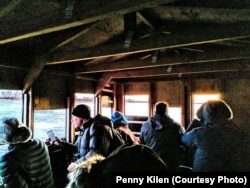 In recent decades, more visitors have discovered the migration, looking up from car windshields as wave after wave of cranes fill the sky for six or more weeks, or crowd into river blinds — a structure that allows bird watchers to remain hidden while peering through camera lenses and binoculars in awe. 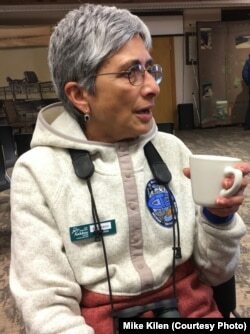 Neseem Munshi of Colorado has been coming to Nebraska to see the crane migration for many years and compares it to the world's other great migration in her native Africa -- the wildebeests. “The sound that they make is such a moving, ancient sound. If I could just live and breathe that sound, I would be a very happy person,” said Munshi, who was raised in Kenya and today lives in nearby Colorado. Chris Helzer, science director for Nature Conservancy of Nebraska, in describing the arrival of the sandhill cranes, said, "The best description I've read is like a dandelion seed falling gently." “The best description I’ve read is like a dandelion seed falling gently,” said Chris Helzer, science director of the Nature Conservancy in Nebraska, which also gives blind tours to members and donors. FILE - Sandhill cranes fill the skies at sunset, descending to their roost on the river where they are protected from predators. As the sun rises, crane watchers look out the holes in the blinds at Aububon's Rowe Sanctuary to spot sandhill cranes perched on the river or flying overhead, near Gibbon, Neb., March 16, 2019. “Everyone can’t believe the beautiful colors. The hues in the sky and the river so blue and, as Jane Goodall said, the ‘whiffs of smoke’ as they come from the sky and come into roost,” Krohn said.